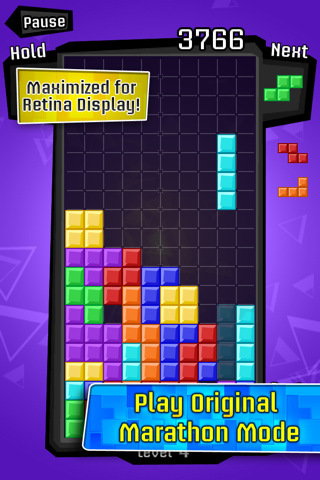 This is the official TETRIS game developed by EA Mobile for the iPhone with over a million downloads worldwide. You can play 15 levels in classic marathon mode, slide, rotate & drop your tetriminos into place with touchscreen controls. If you want you can play your music while you play. The game keeps your high score so you can improve it each time. New modes include the Wrecking Ball, Minimizer, Bubble Wrap, Magic Crayon & Smashdown. The game is missing the original themed music however that you have come to be so used to hearing, instead choosing to go with an unfamiliar jazz background music. More levels and a lower price point wouldn’t hurt either. Overall, if you’re looking for TETRIS on your iPhone this one’s your only way in, and will have to do for now. AppSafari review of iPhone TETRIS was written by Joe Seifi on August 5th, 2007 and categorized under App Store, Fun, Games. Page viewed 6792 times, 1 so far today. Need help on using these apps? Please read the Help Page.